The fight was over a POCO. Sometimes, I forget that they are there to do more than bait fights. It seemed like a good idea. A dozen were already logged into the system. A fight, a fight, a fight. That is what led back to the frantic jumps back to Molden Heath. It seemed like a guarantied fight. While we moved everyone we started inviting people. Last night, Late Night invited us. It seemed as if we could do the same thing. Pings went out and chats were opened. We're not a large corporation. We never forget that. It doesn't stop us from giving things a go. 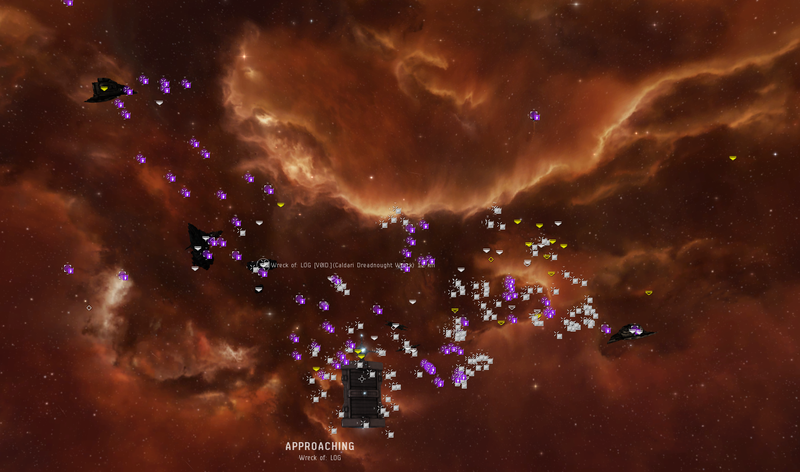 They formed up in high sec. That is rather sensible. We kept watch and once they undocked it was simple enough to select our fleet. It goes back to having a lot of things. We decided to dress up. T3s with triage support. Why not. We never fly this. How shiny. I purchased an entire second Loki for poor Damay who just joined corp and didn't have a T3 to fly. If it made it through the night I had my backup armor fleet Loki. That one is different from my Blops Proteus and my shield, cloaky nullified Loki. The fleet we were jumping into was an armor fleet of mixed battleships, random battlecruisers, and a cruiser or two. We were in a snuggly T3 ball with some heavy assault cruisers for taste. We had seen their five blackbirds jump into the system earlier. We refit for ECCM and headed out. We landed, they were waiting for us. They had local reps on field. We didn't. We dropped triage. They dropped triage. They started to die one after another. We dropped dreads. They dropped dreads. We kept shooting their stuff. They dropped more dreads. We killed some cynos. And some more dreads came in. And a few more. We killed some of theirs. They killed some of ours. Our carriers at one point decided to re-triage instead of bailing. We managed to get two of our dreads out and our carriers started to bail but didn't make it. 99 people in local for a random low sec POCO fight. Once our last carrier was down and not a single one of our fleet was tackled, we left. They warped their capitals off the field. Our dead capital and triage fleet had reshipped to Guardians and were headed back to us. 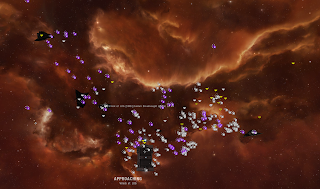 We went back onto the field to try to nab a late dreadnought but failed. We killed a few more things as they quit the field, leaving us alone with the wrecks, abandoned drones, and general adrenaline high. Three of us logged in blockade runners and we looted the field. All loot will be spread among those who lost things. Mistakes were made. We only brought one cyno. Whoops. We could have used a second because we lost Wex due to him being outside of Triage range early in the fight. We all motored out at one point and had to scuttle back. Fortunately, they made mistakes as well. One of their dread groups came in way out of range and couldn't apply their DPS. This gave us a lot of time on the field to keep working at their dreads. Playing with capitals in a group our size is always up in the air. We use them enough and are willing enough to bring them into the game that it is easy to counter. While we would have loved to have killed everything on the field and walked away, it was not to be. We got kicked nicely in our capitals. I believe at this point I am supposed to say, "Didn't want that anyway." Of course that is not the truth. We absolutely would have prefered not to lose our capitals. However, we also would prefer to lose them then to never bring them to the field in case we lose them. We play with expensive toys and that means that sometimes we are going to lose them. We often chose to step into bad fights. Most of the time we do much better than we are supposed to. This time, not so much. I'm pleased that we took down 3 dreadnoughts in the middle of that. Our subcap to subcap fight went very well, too. But so many dreadnoughts. This is rather similar to when we jumped on Solar's friends/blues/whatever at a Poco over the summer and they stomped us into the ground. Poor Van. He was refitting when he died and of course the eve-killboard trolls jumped right on that. I might have the wrong hobby. It seems that skimming peoples killboard and commenting based off of the mail must be quite the popular hobby. "Sometimes you have to go into a trap without a bat phone and get fucked so you're not so smug next time." It has been boring in Molden-heath without you guys we are looking forward to your return. ugh. picture is work safe. url link/file name is questionable.